I saw the best Richard II I suppose I’ll ever see on stage last week at the Lincoln Center Festival. The Druid Theater Company of Ireland put on a marathon seven-hour production (I saw the first half) of excerpts of the four Shakespeare history plays Richard II, Henry IV Parts One and Two, and Henry V. You knew you were in for a treat the moment it started, when Marty Rea entered as Richard, his face painted a ghostly white, surrounded by other characters in more conservative costumes just a bit reminiscent of Duran Duran. Marty Rea as Richard II and Derbhle Crotty as Henry IV. It was only the beginning of his commanding performance as Richard. 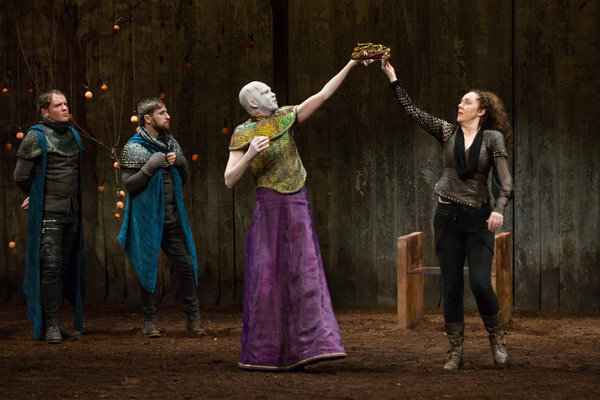 Major parts, including Henry IV, were played by women, and the Irish accents every actor used to deliver the lines – Shakespeare writing about the founding of the English nation, as spoken by the Irish – were clear and passionate and yet tinged with political meaning. This is a company that loves Shakespeare so much it went straight for the plays that, according to director Garry Hynes, have the shadow of the colonization of Ireland over them at all times. What a thrill writer Mark O’Rowe must have had cutting so many scenes, and making a lean narrative out of the plays that I, for one, usually find too windy to enjoy. And talk about a reactive protagonist! Richard is besieged by problems that question his very legitimacy from the start, but never seizes control of the course of the plot. If a story, as we’re told again and again, is a character in pursuit of a goal, then this is a pathetic story, since the few attempts he makes to take any initiative are so ill-informed and going nowhere, no one would ever write this play today. And yet you felt his vulnerability the whole time, and the enormous weight of the sadness of his life. The night I attended there was a talk back afterward, and Rea said that the closest character he could actually relate to as he tried breathing some life into Richard was Michael Jackson: chosen to be king when he was too young to be a fully formed person, and ending up an emotional deformity. An Irishman channeling the King of Pop to make Richard II believable. A night I’ll never forget.